Kate Davies, CBE commenced in December 2012 as the Director of Health and Justice, Armed Forces and Sexual Assault Referral Centres (SARCs) for NHS England. She is a national director of three areas of direct commissioning, working to support the commissioning of healthcare services across England for serving personnel, veterans and their families, Sexual Assault Referral Centres (SARCs) and healthcare services in prisons, secure children’s homes and training centres, as well as immigration removal centres. This national role is to assure high quality, consistent and sustained services with a strong focus on health inequalities and outcomes for patients and their families. Kate has developed and led the national partnership agreements with the Ministry of Defence for Armed Forces commissioning, the Ministry of Justice for prisons and the children and young people secure estate and the Home Office for immigration removal centres. The cross departmental partnership agreements focus on core objectives and outcomes across government for key patient areas that can only be delivered in partnership with cross government agreements. Veterans mental health has been a focus for the partnership agreement between the Ministry of Defence and NHS England who have secured commissioning for veterans’ mental health services across England (The Veterans’ Mental Health Transition, Intervention and Liaison Service and the Veterans’ Mental Health Complex Treatment Service). From a health and justice perspective, the partnership agreement has supported the development of the national Liaison & Diversion Programme and Street Triage. Kate has developed and lead and increased provision for survivors of sexual violence including the partnership publication of a NHS Sexual Assault and Assault Strategy in 2018 (SAAS). Previously, Kate was the Executive Lead for Prison, Detainee and SARCS Healthcare Commissioning for East Midlands, when she led the healthcare commissioning for prison and offender health. 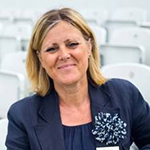 Kate has also worked as the Strategic Director of the award-winning Nottinghamshire County Drug and Alcohol Action Team from December 1995 to May 2009, co-ordinating and delivering the Government’s National Drug Strategy. From 2003 to 2010, Kate was seconded to the University of Central Lancashire, International School for Communities Rights and Inclusion as Director of Black and Ethnic Minority Community Engagement, focussing on the health and social care of diverse groups who experience discrimination and/or disadvantage and directing the national community engagement programme. Kate has been a Non-Executive Director on the National Treatment Agency Board in England between 2000 and 2013. She was also a member of the Government’s independent Board for the Prison Drug Treatment Strategy Patel Review, which implemented the Substance Treatment Service and Strategy and delivery across England and currently acts as an Ambassador for Diversity in Public Appointments for the Government Public Appointments Commission. Kate started her career in the Probation service and was a qualified Probation Officer from 1986 to 1995, before joining the NHS. Kate was awarded an OBE in 2009, for services for disadvantaged communities. In 2018, she was awarded a CBE for her work to improve services for some of the most vulnerable groups and an Honorary Doctor of Staffordshire University in recognition of her commitment to health and social equality.